The DGAM held a tribute to Khaled al-Assad at the National Museum in Damascus on August 23, 2015. In Counterpunch, Franklin Lamb discusses the deaths of Khaled al-Assad and Qassim Abdullah Yehya, whose death was reported in our last newsletter, calling them heroes. There is some disagreement about when this event took place, with some claiming August 23 2015, others as long ago as one month. The most recent estimate places the destruction of the temple “Sunday, August 23, 2015 shortly after 4pm.” UNESCO has branded this event a war crime. See further coverage from the BBC News, the Guardian, CNN, and Al-Jazeera. In addition, Palmyra News Updates reports damage from air strikes on August 17 2015, which have caused additional damage to the site of Palmyra. A new video shows the damage in different parts of the Ancient City of Aleppo, by Aleppo Archaeology August 13 2015. Photos show the damage to Naser Street in Ancient Aleppo, by Aleppo Archaeology, August 21 2015. A video by the Association for the Protection of Syrian Archaeology shows damage to Nour Eddin/Nour Alddin Mousque in the Ancient City of Aleppo, published August 23 2015. They have also shared Halab News’ photos of damage to old houses in Al-Bayada on 25 August, available here. The DGAM further reports on August 21 2015 that the fifth century Mar Elian Monastery in Al-Qaratayn near Homs has been destroyed by ISIS, using bulldozers and other heavy machinery. The action was condemned by UNESCO. The Daily Express, on 21 August 2015, also covered the story suggesting as well that the abbot, Fr. Jacques Mouraud, and other personnel had been abducted, the saint’s relics desecrated, and Roman frescoes at the site destroyed. According to THONLINE.COM, they also removed the bells first. However, that article also suggests that the people were abducted, but not killed. On August 18 2015 the DGAM reported that Roman sites at Jmarein village near Daraa had been damaged in fighting. Recent photos of Raqqa – Ar Rasafah have been published by ISIS, and shared by the Association for the Protection of Syrian Archaeology on 23 August 2015. 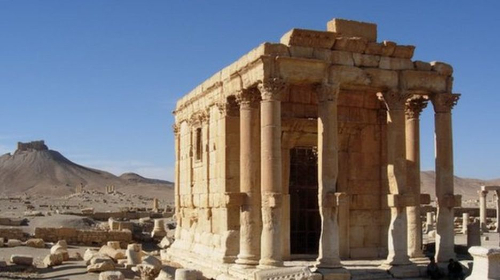 The DGAM reports on August 24 2015 that further damage has taken place around Qala’at Simeon in NW Syria, part of the UNESCO World Heritage Site the Ancient Villages of Northern Syria. A video by the Association for the Protection of Syrian Archaeology shows damage to the site of Tell Adeh from illegal excavations, August 23 2015. Franklin Lamb in Counterpunch on August 7 2015 writes about Syrian Christians protecting their religious heritage. PBS Newshour, August 19 2015, reported on the work of the DGAM to save Syria’s heritage – thousands of priceless relics are being gathered in the capital of Syria. On August 14 2015 members of the UNESCO project Emergency Safeguarding of Syrian Heritage visited Damascus. 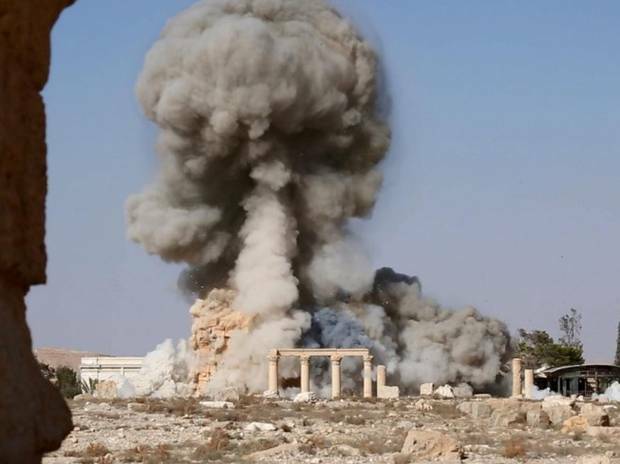 The Antiquities Coalition has posted numerous videos from its series “Culture and Threat: Terrorism and Profiteering”. The most recent report from ASOR’s Syrian Heritage team is available here. The petition site Change.org is lobbying UNESCO to honour Khaled al-Assad. For details click here. If you do sign, and can add a comment, remember the many other Syrians who have died protecting their heritage. Khalad al-Assad is by no means the first member of the DGAM, or the first Syrian volunteer, to die for protecting their heritage. Others have been threatened and paid the price, (e.g. “In Syria, Yahya Ibrahim guarded Bosra’s ancient ruins, one of the world’s best-preserved Roman amphitheaters. In January, armed militants broke into his office and demanded he not go to work. They shot and killed him when he refused.” (Vice News) or Ms. Huda Al-Hamoud, hijacked and killed (DGAM Report).) Many others have simply died just for daring to leave their houses and go to work, even when it’s dangerous. 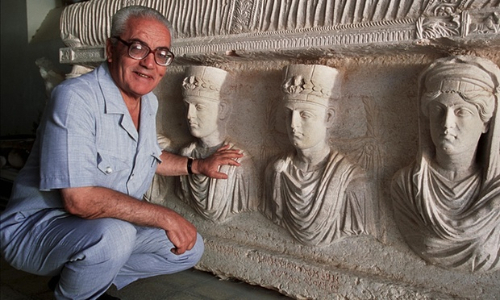 A great number of men an and women in Syria – and elsewhere – are taking amazing risks to protect their heritage: they all deserve to be honoured. The Guardian on August 24 2015 argues “Why it’s all right to be more horrified by the razing of Palmyra than mass murder”. The British Council discusses the importance of cultural heritage on August 21 2015. Turkey’s Daily Sabah on August 21 2015 offers a view on why Syria’s antiquities must be saved. CNN interviews the DG of the DGAM, Maamoun Abdulkarim, on August 19, 2015, under the title “Saddest job in the world”. The WSJ asks on April 19 2015 if we should buy antiquities from “dubious sources” so that they might be saved [subscription needed]. The Global Post argues that “The US Should Bring Back Monuments Men” on August 20 2015. Al Arabiya on August 12 2015 discusses the obliteration of Syria’s heritage.